Craving a delicious coffee…but not so enthusiastic about spending hundreds of bucks on a posh coffee machine (that’ll probably sit in the cupboard because it’s too complicated to use anyway)? Forget coffee machines. 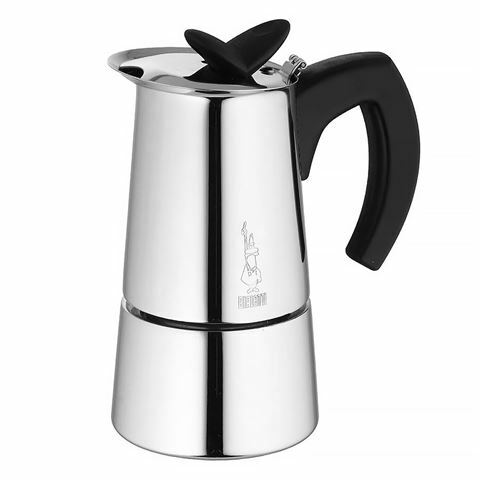 You can make coffee that’s just as delicious using only your stove…and an amazing Bialetti Coffee Maker. It’s really easy. Just fill the base of the coffee maker with water, pour your ground coffee into the filter and gently heat it on your stovetop. Don’t ask me how it works - it’s all very complicated and scientific – but the water heats up and moves from the base of the coffee maker up to the top of the coffee maker – and the result is simply delicious coffee! Need coffee – like now? If your day is frequently planned around obtaining, consuming and enjoying coffee – not that there’s anything wrong with that, of course – you’re going to love Bialetti’s Musa Espresso Makers! Not only are these shiny steel coffee makers beautiful to look at – they also help you make astoundingly lovely coffee… and now they're suitable for induction cooktops too! Body made from top quality stainless steel. Moulded resin handle stays cool during use. Suitable for use on gas, electric, ceramic and induction cooktops. Use on a low flame only, or you’ll risk damaging your coffee maker.